Pretty Beautiful Unlimited | Do You Believe in Faeries? Hello and happy Friday! Its a gorgeous day today and I am super excited about this blog post so its just good all around at the moment. 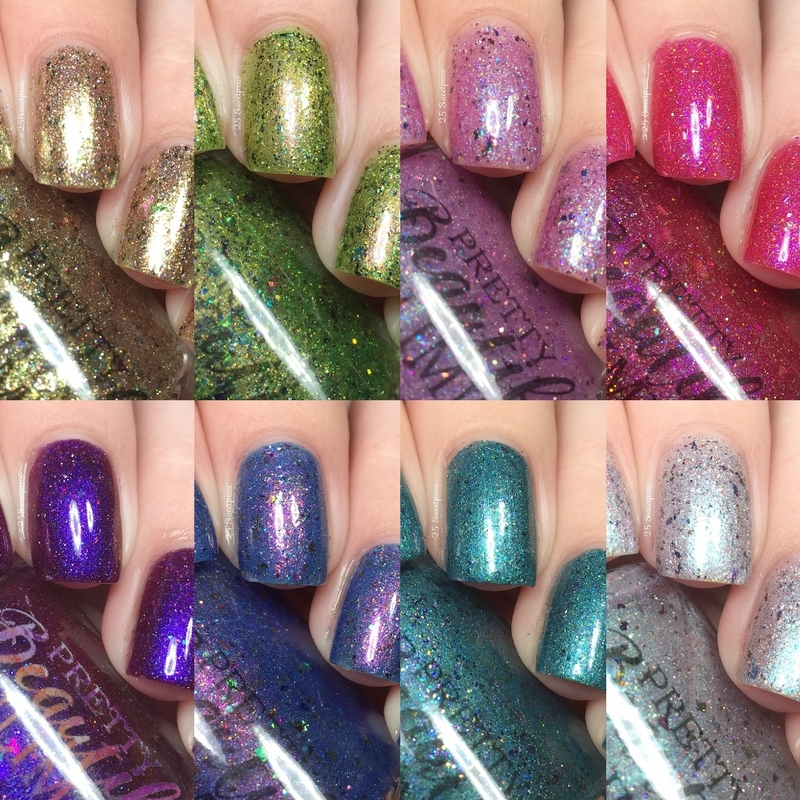 Tomorrow, 3/17, Pretty Beautiful Unlimited is release a new collection called Do You Believe in Faeries? and today I have all of the swatches! It consists of 8 amazing polishes so lets get busy, also at the end there will be a link to the swatch video as well on my Youtube Channel! a rosey pink jelly base, gold, copper, silver and chameleon micro glitters, silver holographic micro flakes and violet to blue color shifting pigments and a mix of 6 different crystal chameleon flakes. This formula was great, its a tad sheer on the first coat but builds completely with a second coat. I am just obsessed with this polish. Its so vibrant and electric. Its a stunning shade of pink, like a juicy watermelon and as you can tells its packed with holo glitters and really neat flakies! 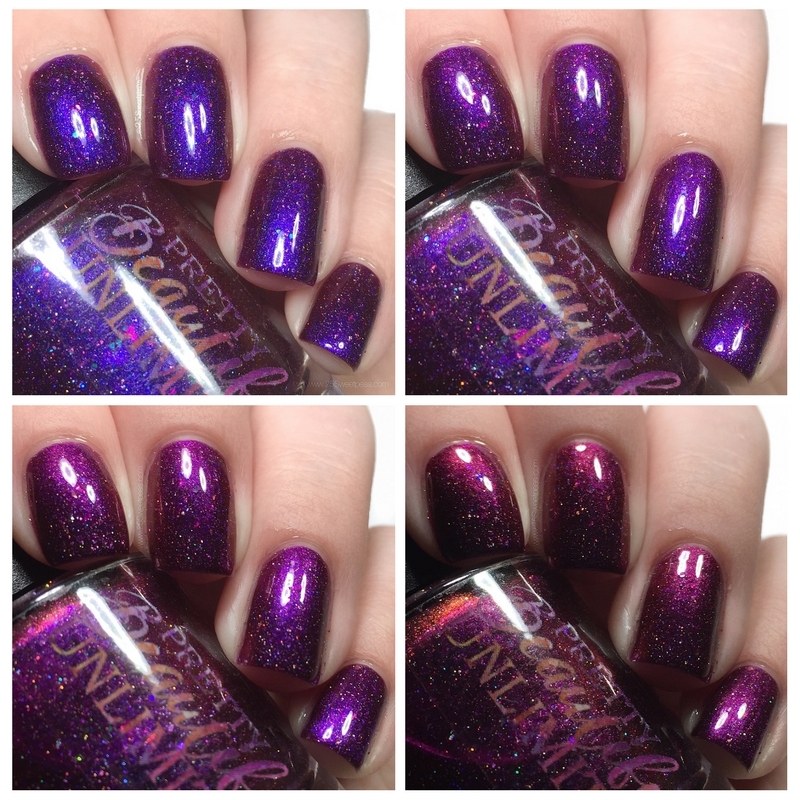 It also has a bold blurple flash in it that shows in the middle of the nail in photos! I am just obsessed! I thought since this whole collection is just so mesmerizing in the bottle and up close I would focus on that for this post. That being said there will be a bottle shot like this for each polish in hopes to show you all of the neat shifts each polish gives off! a lilac/mauve/pink to near colorless thermal (took 3 thermal pigments to create this shade), packed with aurora pigment, pink, purple and silver holographic micro glitters and flakes, lime/copper/blue crystal chameleon flakes and 2 different UCC flakies. This is so nice and it is a very very soft changing thermal. I didn't quite capture that in photos but it is in todays video so to see this color shift to a much lighter color be sure to check out the video here. This was a bit sheer but again it built up in just two coats. That was basically the same for all of these polishes so I may start to sound like a broken record, just sayin! See that neat blue shimmer in there? Its so neat how many colors pick up in each of these polishes! a holographic base with a gold/green shift, silver holographic micro glitters, platinum silver micro flakes, purple/red/gold crystal chameleon flakes and a blend of 3 different UCC flakies. Talk about a perfect St Patricks Day Gold Polish! Ahh, just look at this! Its stunning this gold is not only gold on but it also has this insane gold shimmer from the flakes + is has a green shift that really just makes it! Here the green shift really shows nicely, Its really just a stunner if I do say so! Look at that shift going on in the bottle! a yellow leaning lime green jelly base with green/gold/white/red chameleon pigment, blue/green/purple chameleon micro glitters, silver holo micro glitters and a mix of 3 different UCC flakies. Dewdrop is perfectly named and it is such a nice yellow/green polish! This one is just like the rest where it build up in 2 coats. I will have to say I did notice a hint of staining after wearing this one. It tends to happen with greens like this so my best advice is to just maybe double up on your base coat! Oooo look at how many greens show up in these photos, its so pretty and universal! I am loving it! a holographic base with a pink/blue/violet/green shift, chameleon and silver holo micro glitters, ruby metallic and silver holo micro flakes and a mix of 4 different UCC flakies. This is such a neat icy polish. Its kind of got a silvery/frosty vibe, but then you start moving around and then you great a nice minty teal shift and then the purple! Its really neat, and hard to show on camera. You can see the more purple shift below tho! Its one of those polishes that would go with anything for sure! Its really neat and pretty! a teal crelly holo base with silver holographic micro flakies and glitters, 2 types of chameleon glitters, a mix of aurora and chameleon pigments and 3 different UCC flakies. Yessss, I love this one so much! Its such a neat deep teal with a neat blue purple shift in it. 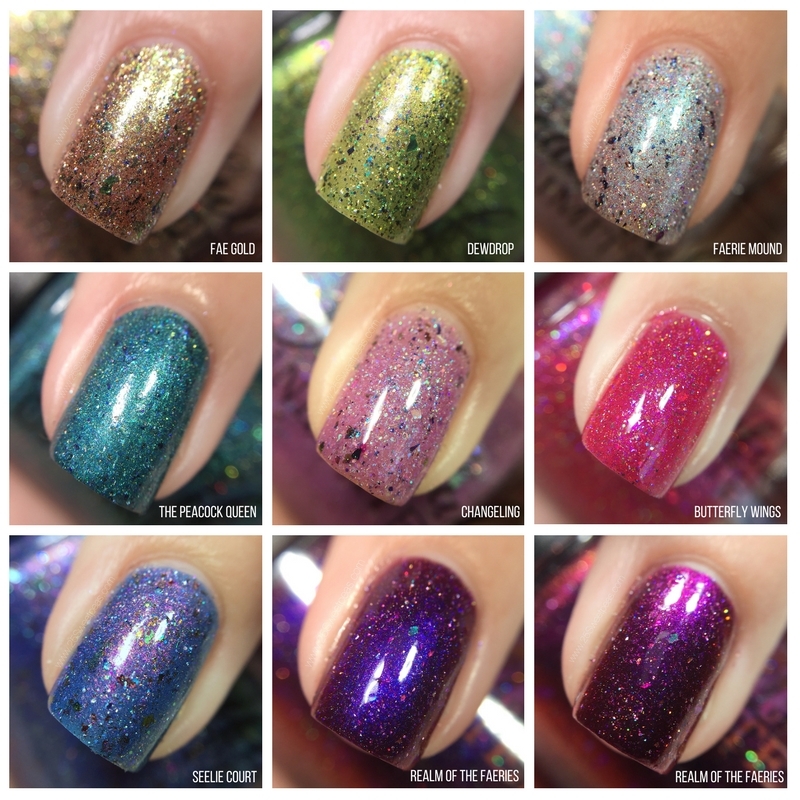 Its also packed with holo glitters so it will just be forever distracting! Look at the shift in the bottle! Epp! So pretty. Its formula was amazing! The first coat was almost all you needed but the 2nd coat just takes it over the top and brings it to life! a periwinkle jelly base loaded with aurora and chameleon pigments, a mix of 5 different UCC flakies and a blend of iridescent and chameleon micro glitters. Oh yes this is a neat one! Great formula and just look at this color. Its so unique with this dusty blue/periwinkle base then with the purple flash and the pink and green stages in the shift. Its just so neat! Don't you just think its amazing? Its so unique and I am loving it! a red base with a red/copper/violet multi chrome pigment, silver holo, iridescent teal and blue/purple/red chameleon micro glitters and 2 types of crystal chameleon flakies. This has to be one of the neatest polishes maybe ever! Its SOOOOO SHIFTY! Which is why below you will find a "stages" photo. First off the formula was great. The first coat was near to being done! The second one just took it to the next level. It just looks like a really neat purple with a cobalt blurple flash in it but then you start to move it and whoa! It turns into a lovely violet, then a marsala and bam its all orange/red firey! SO neat! The Macro really shows the first well I thought! I mean just look at all of that color! Its amazing, and for it to all be in one polish, like WOW! Ok and now you were probably starting to wonder, where are the macro nails? Well here they are! All in one shot and labeled so you can see things all together, and use it as a quick way to see ALL of the polishes! I did include 2 photos of Realm of the Faeries since the shift it so dramatic! Well that is it guys! These are releasing on Saturday March 17th at 11am CST! There will be an option to purchase the whole collection and with that comes a vinyl nail art sheet that ya'll will see me use soon! So be sure to check that all out now. The listings of the polishes are currently available you just can't purchase them till tomorrow. You can check that all out here. Let me know what your favorites are and if you are going to pick up any in the comments below! Butterfly wings is so pretty and my favorite from the collection with the peacock queen being a close second. What a lovely collection! Butterfly Wings is totally my kind of colour! My faves are Butterfly Wings and Realm of the Faeries. Gorgeous! Realm of the Faeries is absolutely stunning! Realm of the fairies and Fae gold are soo pretty! Oh wow, Seelie Court is gorgeous! I love the combo of holo and flakies, therefore I love all of these shades! Beautiful swatches! Seelie Court Is so pretty!!!! Seelie Court is stunning.. Love the shift.. Butterfly wings and Fae Gold are gorgeous too..